Islam has long been a part of the West in terms of religion, culture, politics and society. Discussing this interaction from al-Andalus to the present, this Handbook explores the influence Islam has had, and continues to exert; particularly its impact on host societies, culture and politics. 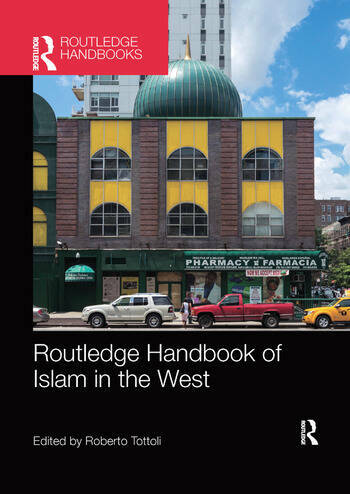 Providing a sound historical background, from which a nuanced overview of Islam and Western society can be built, the Routledge Handbook of Islam in the West brings to the fore specific themes and topics that have generated both reciprocal influence, and conflict. Presenting readers with a range of perspectives from scholars based in Europe, the US, and the Middle East, this Handbook challenges perceptions on both western and Muslim sides and will be an invaluable resource for policymakers and academics with an interest in the History of Islam, Religion and the contemporary relationship between Islam and the West. Roberto Tottoli teaches Islamic studies at the University of Naples L'Orientale, where he is currently director of the Department of Asia, Africa and the Mediterranean. He has published studies on the biblical tradition in the Qur’an and Islam (Biblical prophets in the Qur’an and Muslim literature, Richmond, 2002; The stories of the prophets of Ibn Mutarrif al-Tarafi, Berlin, 2003) and the medieval Islamic literature. He also dealt with the aspects and dynamics of contemporary Islam, editing the volume Le Religioni e il mondo moderno. III. Islam (Torino, 2009). Alessandro Vanoli is Postdoctoral research at Department of Paleografy and Medieval History, University of Bologna. His research is focussed on the history of the West Mediterranean and the relationship between Islam, Judaism and Christianity in the Iberian Peninsula and in Sicily during the Middle Ages. His publications include, La Sicilia musulmana (Bologna, 2012); La Reconquista (Bologna, 2009); La Spagna delle tre culture. Ebrei, cristiani e musulmani tra storia e mito, (Rome, 2006). Mercedes García-Arenal is a Research Professor at the Centro de Ciencias Humanas y Sociales, CSIC, Madrid. Her first book was Inquisición y Moriscos: los procesos del Tribunal de Cuenca, (Madrid,1978). The most recent, with Fernando R. Mediano, Un Oriente español. Los moriscos y el Sacromonte en tiempos de Contrarreforma, (Madrid, 2010). Annliese Nef is currently Maître de Conférences at the University Paris 1-Panthéon. After dedicating her PhD to Norman Sicily, she is now studying Islamic Sicily. She is author of Conquérir et gouverner la Sicile islamique aux XIe et XIIe siècles, (Rome, 2011) and editor of A Companion to Medieval Palermo, forthcoming. Nathalie Clayer is Professeur at the EHESS and a senior research fellow at the CNRS (Paris). She has published on religion, nationalism and state-building process in the Balkans and the Ottoman Empire, publications include Aux origines du nationalisme albanais (Paris, 2007) and, with Xavier Bougarel, Les musulmans de l’Europe du Sud-Est (XIXe-XXe siècles)(Paris, 2013). Maréchal, Brigitte is director of the CISMOC (Centre for Interdisciplinary Research on Islam in the contemporary World) at IACCHOS Institute and Professor at the Université catholique de Louvain. Her publications include: Muslims in the Enlarged Europe (2003), Les Frères Musulmans en Europe (2009) and Yearbook of Muslims in Europe as co-editor. Ghaliya Djelloul, is a PHD candidate at CISMOC and teaching assistant at the Université Catholique de Louvain. Her research covers intersections between gender and islam and her latest publication is: Parcours de féministes musulmanes belges ( 2013). Kambiz GhaneaBassiri is Associate Professor of Religion and Humanities at Reed College. He is the author of numerous publications on Islam in America, including A History of Islam in America: From the New World to the New World Order (2010). Herbert Berg is Professor of Religion specializing in Islam in the Department of Philosophy and Religion at the University of North Carolina, Wilmington. His research focuses on Islamic origins and on African- American Islam. His publications include Elijah Muhammad and Islam (2009) and The Development of Exegesis in Early Islam (2000). Kathleen M. Moore is Professor and chair of the Religious Studies department at the University of California Santa Barbara. Moore teaches courses on Islam in America and Muslim diasporas and the law. Her most recent book, The Unfamiliar Abode: Islamic Law in the United States and Britain, was published in 2010. The book provides an account of new forms of Islamic legal knowledge in diasporic networks. She is co-author of a book titled Muslim Women in America: Challenges facing Islamic Identity Today, and has written several articles on American Muslims and the law. She is currently writing a book on Islam, Feminism and the Law: Difference in Diaspora, about anti-essentialism, religion and justice seen through the lens of Muslim women in diaspora. Mark Lindley-Highfield of Ballumbie Castle is Lecturer in Anthropology in the Department of Anthropology at Cirencester College and Associate Lecturer and Research Affiliate in the Department of Religious Studies at the Open University. Mark has carried out a prolonged period of fieldwork studying the motivations for religious conversion to Islam and Anglican Christianity in Mexico. Marco Gallo graduated from the Faculty of Philosophy and Letters at the University of Rome La Sapienza. He has been living and working in Buenos Aires for over two decades, where he is Chair John Paul II at the Catholic University of Buenos Aires. He has written contributions and articles on interreligious dialogue, with a particular focus on Islamic-Christian relations. Luca Mavelli is a Lecturer in Politics and International Relations at the University of Kent. His research focuses on questions of secularity, postsecularity, security and political violence in international relations. He is the author of Europe’s Encounter with Islam: The Secular and the Postsecular (Routledge, 2012) and has co-edited and contributed to the 2012 Special Issue of the Review of International Studies on ‘The Postsecular in International Relations’. His articles have appeared, among others, in the European Journal of International Relations, Millennium: Journal of International Studies, and the Journal of Religion in Europe. Adis Duderija received his Ph. D. from the School of Social and Cultural Studies at the University of Western Australia in 2010. He has authored a number of works on western Muslim identity construction and contemporary Islamic reform and hermeneutics. He is the author of Constructing a Religiously Ideal ‘Believer’ and "Woman" in Islam: Neo-Traditional Salafi and progressive Muslim Hermeneutics (2011). Anna Triandafyllidou is Professor and Director of a Programme on Cultural Diversity in a Globalised World at the Robert Schuman Centre for Advanced Studies, European University Institute, in Florence, Italy. She is also Senior Fellow at the Hellenic Foundation for European and Foreign Policy (ELIAMEP), in Athens. Salua Fawzi is currently a PhD candidate at McGill University at the Institute of Islamic Studies. Her research focuses on the identity construction of Muslim American youth, with a particular emphasis on their involvement in Muslim student associations and how this shapes their understanding of religious orthodoxy, authority, and praxis. Karim H. Karim is a Professor and the Director of the Centre for the Study of Islam at Carleton University in Ottawa, Canada.He has served previously as Director of Carleton’s School of Journalism and Communication and the Institute of Ismaili Studies in London, and has been a Fellow of Harvard University’s Center for the Study of World Religions. He holds degrees in Islamic Studies and Communication Studies from Columbia and McGill universities. Dr. Karim has been a distinguished lecturer at venues in North America, Europe, and Asia. He won the inaugural Robinson Prize for his book Islamic Peril: Media and Global Violence. Karim is currently working on a three-volume series of books on Western-Muslim relations. Patrick D. Bowen is a Ph.D. candidate in the University of Denver-Iliff School of Theology Joint Ph.D. Religion and Social Change program. He has published several articles on U.S. converts to Islam and Muslims in the U.S.
Tahir Abbas is Professor of Sociology at Fatih University in Istanbul, Turkey. He is author of Islamic Radicalism and Multicultural Politics (2011), and editor of the four-volume Islam and Education (2010), and co-editor of Honour, Violence, Women and Islam (with MM Idriss, 2011). He is a specialist in the area of Muslim minorities and ethnic studies in the West. He is currently completing a critical observational perspective on the Muslim world and Muslim minorities in the West and a monograph on comparative Islamisms based on research and study visits carried out in Turkey, Pakistan and Indonesia. Eric R. Roose is a cultural anthropologist and an art historian with an ongoing interest in the comparative iconology of modern religious architecture. Between 2009 and 2012 he was a postdoctoral fellow, funded by the Cultural Dynamics Programme of the Netherlands Organisation for Scientific Research, at the Amsterdam Institute for Social Science Research. Elisa Banfi is research assistant and a PhD student at the Institut de recherches sociales et politiques RESOP at the University of Geneva. Sylvia Chan-Malik is Assistant Professor of American and Women's and Gender Studies at Rutgers University,New Brunswick. Her research examines the intersections of race, religion, gender, and sexuality through critical frameworks of American transnationalism and comparative ethnic studies, with a specific focus on the history of Islam in the United States. She has published in The Annals of the American Academy of Political and Social Science, The Journal of Race, Ethnicity, and Religion, The Cambridge Companion to American Islam, and the Social Science Research Council's (SSRC) blog The Immanent Frame. Her forthcoming book manuscript is entitled A Part of Islam: Race, Gender, and Muslim American Women, 1923-Present. Dr. Miriam Gazzah is currently a postdoctoral fellow at the Amsterdam Institute for Social Science Research (AISSR), working within the research program 'Islamic Cultural Performances: New Youth Cultures in Europe'. Her research interests include; European-Muslim youth, popular culture, music and Islam. In 2008 she obtained her PhD at the Radboud University in Nijmegen. Her thesis is entitled Rhythms and Rhymes of Life: Music and identification processes of Dutch-Moroccan youth. Johan Fischer is an Associate Professor in the Department of Society and Globalization, Roskilde University, Denmark. His work focuses on modern Islam and consumer culture in Southeast Asia and Europe. More specifically, Johan explores the interfaces between class, consumption, market relations, Islam, and the state in a globalized world. A central focus in this research is the theoretical and empirical focus on the proliferation of halal commodities on a global scale. Dr. Uriya Shavit is a lecturer at the Department for Arabic and Islamic Studies and the Program in Religious Studies at Tel Aviv University. Author of The New Imagined Community: Advanced Media Technologies and the Construction of National and Muslim Identities of Migrants (2009) and numerous articles on Muslim minorities in the West. His studies of the religious law of Muslim minorities are supported by the Israel Science Foundation (Grant 627.11). Qadi Iyad Zahalka currently serves as the chief Qadi of Jerusalem. His PhD dissertation discussed fiqh al-aqalliyyat al-Muslima and the Arab minority in Israel. He has published a number of articles on Islamic law in academic compilations and two textbooks in Hebrew and Arabic on the shar‘i courts in Israel. Francesca Forte gained her PhD in Philosophy in 2008. From 2010 to 2013 she held a two year research fellowship at the Department of Philosophy, University of Milan. Her research interests include; Islamic philosophy (in particular Averroè and latin translations of Arabic texts), the relationship between Islam and human rights, and the matter of History in contemporary Islamic thought. Juliane Hammer is associate professor and Kenan Rifai Scholar in Islamic studies at the University of North Carolina, Chapel Hill. She is the author of Palestinians Born in Exile (2005) and American Muslim Women, Religious Authority, and Activism: More than a Prayer (2012), and the co-editor (with Omid Safi) of the Cambridge Companion to American Islam. Gian Maria Piccinelli is Professor of Islamic Law and Private Comparative Law. Director of the "Jean Monnet" Department of Political Sciences at the Second University of Naples. He has written several comparative essays on Islamic contemporary legal systems with a special regard to civil, commercial and banking law. He directed and collaborated in several scientific research concerning Islamic Law, the Legal Systems of Arab and Mediterranean Countries, ‎Euro-Mediterranean Partnership. Stefano Allievi, Ph.D., is Professor of Sociology at the University of Padua. He specialises in migration issues, Sociology of Religion and cultural change, and has particularly focused his studies and research on the presence of Islam in Europe. He has published extensively on these issues in different languages. Francesco Alfonso Leccese is a specialist in contemporary Sufism with a focus on the Arab world. He obtained his MA in Arab-Islamic Studies (2004) and his PhD in Studies on Near East and Maghreb (2007) both from Università degli Studi di Napoli L'Orientale", Naples (Italy). He has taught History of the Islamic countries at Università della Tuscia, Viterbo (2008-2011) and History of the Mediterranean Countries at Università della Calabria, Cosenza (2009-2010). He is lecturer of Culture and Society of the Arab language Countries at Università degli Studi Internazionali, Rome (2011-2013) and of History of the Islamic countries at Seconda Università degli Studi di Napoli, Caserta (2012-2013). He is currently working on non-ethnical transnational Sufi networks. Roberto Tottoli (PhD, Naples 1996) is Professor of Islamic Studies in the Università di Napoli L’Orientale. He has published Biblical Prophets in the Qur’an and Muslim Literature (Richmond 2002) and The Stories of the Prophets of Ibn Mutarrif al-Tarafi (Berlin 2003) related to the Isra’iliyyat. His recent publications include (authored with Maria Luisa Russo and Michele Bernardini), Catalogue of the Islamic Manuscripts from the Kahle Collection in the Department of Oriental Studies of the University of Turin (Rome 2011) and the Italian translation of the Muwatta’ by Malik b. Anas (Malik ibn Anas, al-Muwatta’. Manuale di legge islamica, (Turin 2011).